Though my wife and I both grew up with dogs, we do not have dogs. There are a number of reasons, not the least of which is that some of in our family have allergies. But this did not keep us from hosting a dear, elderly couple for dinner last week, their little “Sparky” in tow. Love does this. God is love (1 Jn. 4:8). The invitation to Love is always accompanied by an invitation to exchange what is lesser for what is Greater. Specifically, on this night, Love was allowing Sparky to explore every part of the house, knowing the “blessing” to us (and the Benadryl company) would remain long after he was gone… because of the joy it brought our friends. Love was in the tremendous blessing of them sharing their growing-up stories, captivating our children at the dinner table long after dinner was done. Love was in a little, friendly trash-talking with the Mr. during a Cribbage game, because sometimes Love comes in that language. Love was in my smirk, watching Sparky lap up some of the Mr.’s Wild Turkey Honey… and his nap, and our laughter, that followed. Love was in our joint family prayer… hearts united in Him through praise and worship, reflecting on a Psalm and our children’s “prayers from the heart” which specifically included expression of appreciation and blessing for the couple. Love was in little hands lifted in praying over the Mrs. for healing from her recent accident; love was in her tears (ok, and mine) and her head rested on my wife’s shoulder. Love was in our children accompanying them, even arm in arm, as they made their way to their car later than any of us expected, but not nearly late enough. Love is me wishing you could have been there. I wish you could have seen it. It was beautiful. We can’t wait for them to come back, Sparky and all. So consider: how does this correspond to the way we talk to others about Mass? Prayer? Spiritual commitments? Do we readily and easily speak of these to others? So much that we might invite them? I’m guessing, for most of us, the answer is “no.” But therein is the opportunity for the Church’s constant refrain of “Encounter Jesus Christ! Evangelize!” to hit us – and not like a deer in the headlights. Not just as some deed we “ought” to do. Let’s get below that “suppose to” layer. Privately we are beleaguered by religion. We’re good soldiers, but perhaps we wonder: Where’s the life? Where’s all the dynamism of a real, engaging, life-transforming, interactive relationship? This questioning could be a really great thing right now. It’s an honest, good space where God can meet us. We should be encouraged by the truth that if we haven’t really encountered Jesus Christ, we won’t evangelize; but if we really encounter Jesus Christ, everything we do will be evangelization. There’s something to genuinely anticipate here. If committed prayer is not your daily priority, if you’re not enthusiastically sharing the story and inviting others — God’s conquering love awaits you. Right now, perhaps. 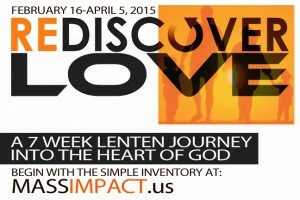 This Lent: Rediscover Love (Join us). Lent is not about something as trite as simply giving up sweets. Lent is an invitation from the Heart of God to more deeply find ourselves in Love, in Jesus Christ. This is time for the Great Exchange: giving up lesser things for the Greater. God is inviting you and me to “Rediscover Love” and then, to make Him known. 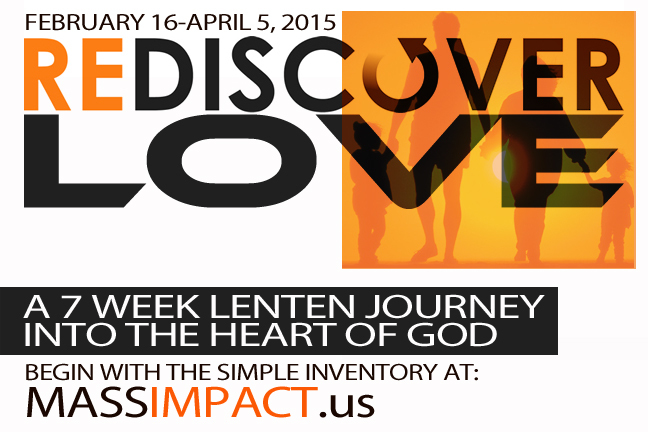 This seven week, Lenten journey begins the week of February 16 and ends on Easter. Take the 60/7 challenge. As a family (or peer group), commit (schedule) 60 minutes a week for seven weeks. Right now schedule just 10 minutes with your family or group of friends. Have each member complete the simple, one-page Live IT 60/7 Inventory. It asks members to measure seven important areas revealing the state of God alive in your relationships. Then download and print out the Live IT Gathering Guide. Schedule your weekly gathering over the subsequent seven weeks (Page 2). Commit! God’s grace will follow. If you are faithful, God will come more fully alive in your relationships. This will be demonstrated when you take the Live IT 60/7 Inventory again at the end. Register Now. This enriching Lenten resource is free (please pray for our benefactors). But to maximize your experience, and partner with us in this movement, we ask you to plug in here: RediscoverLove.eventbrite.com. Thank you!